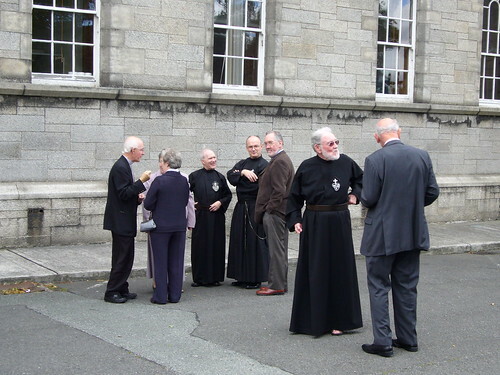 Before I go to the Chapter, I remember that I have not yet posted the photographs I took on 3 September at the 150th anniversary celebrations for the Passionists in Ireland. So here they are! 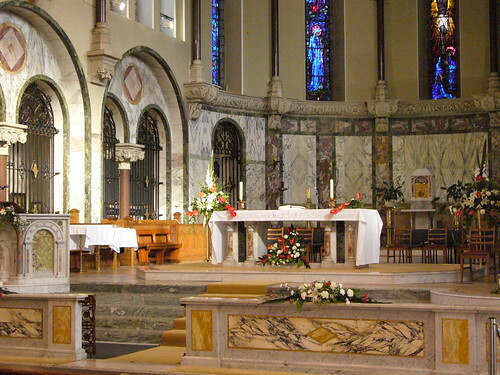 The Mass was at 11.00 a.m., so I went out at about 9.00 to take some pictures before people arrived. 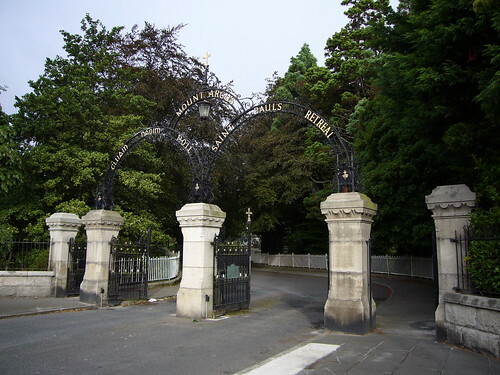 Here are the front gates which were given by An Garda Siochána, the national police service of Ireland. Looking back at the gates from the front avenue. 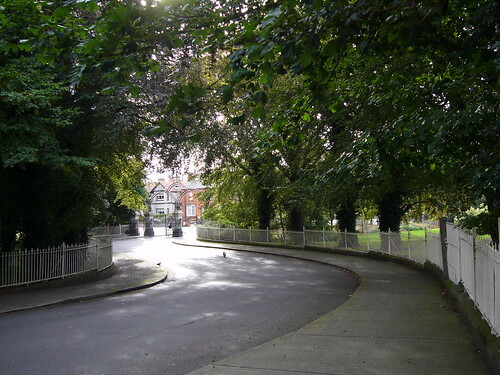 The trees on the avenue are copper beeches. 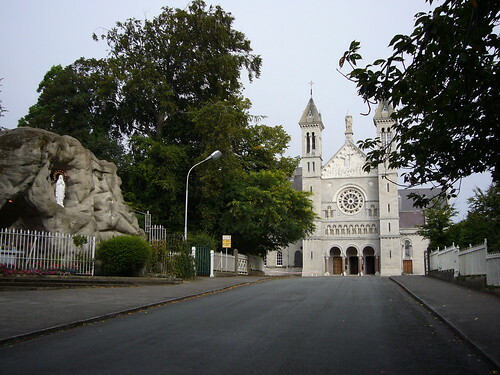 Turning round at this point on the avenue, you see the Lourdes Grotto, with its new altar, and the facade of the Church of Saint Paul of the Cross, Mount Argus. 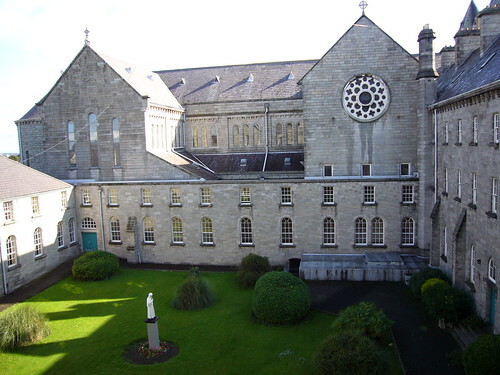 The figure at the top of the facade is Saint Michael the Archangel whose feast day is tomorrow and who used to be principal patron of the Congregation until Our Lady of Sorrows took over the job about thirty years ago. We still celebrate his feast with solemnity, although it is now a festum and is shared with Saints Gabriel and Raphael. Under the statue is a relief showing Saint Paul of the Cross preaching to the crowd from the palco or mission platform. If you enlarge the picture, you might just see the angel whispering in his ear as he preaches. This is the classic view of the Church and Retreat (monastery); there used to be a pond here surrounded by grass and shrubs which made the view even more classic! 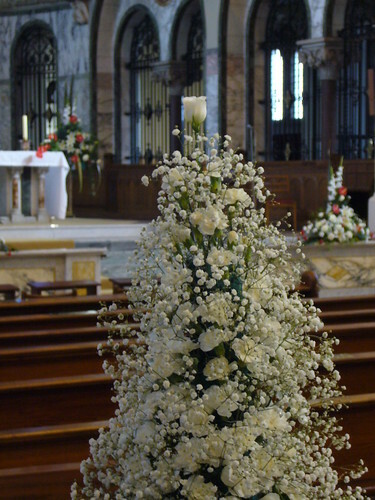 Flower arrangers from Mount Argus and Harold’s Cross Altar Societies were busy putting the finishing touches to their work. The sanctuary too was decorated with flowers, but fortunately there were not enough to serve as road blocks for processions (which sometimes happens on these occasions). I went back up to my room to collect my alb (-this is the view from my window) and then went along the ground floor corridor to the sacristy (i.e. from right to left in this photograph). The white statue in the centre is Saint Gemma Galgani. I didn’t take any pictures during the Mass, but here is part of the procession at the end of Mass. In the centre is the Superior General, Father Ottaviano D’Egidio, with Father Brian D’Arcy on the left and Father Frank Keevins on the right. 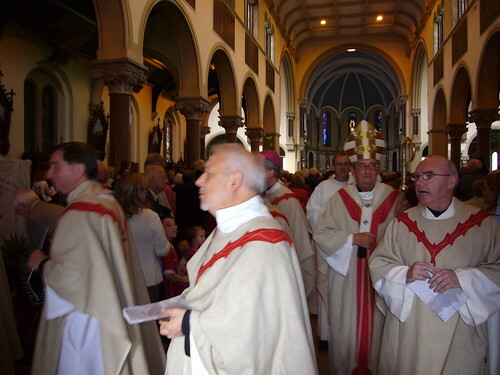 Behind them you can see Archbishop Diarmuid Martin of Dublin with Bishop McKeown’s red zucchetto on the left and the Archbishop’s MC (in alb) further back. The church, which seats about 1,800, was absolutely full. Here are some of the congregation after Mass. If you look closely, you will see Archbishop Martin’s mitre in the middle of the crowd. 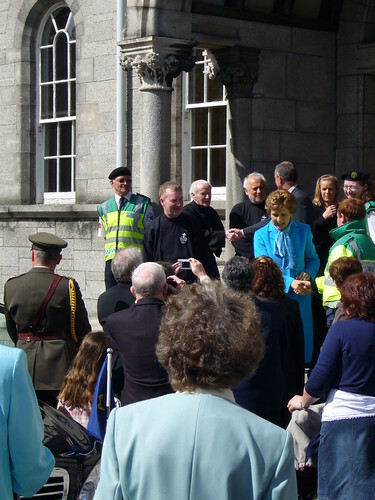 We were very happy to welcome the President of Ireland, Mary McAleese, and her husband to Mount Argus for the Mass. 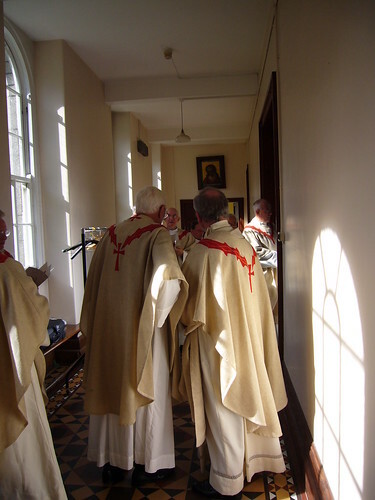 Here they are leaving the Retreat after Mass. Doctor McAleese (the President’s husband) is talking to Father Ottaviano and shaking hands with Father Ambrose, who is well known here in Glasgow, having been chaplain to Glasgow Royal Infirmary for seventeen years. 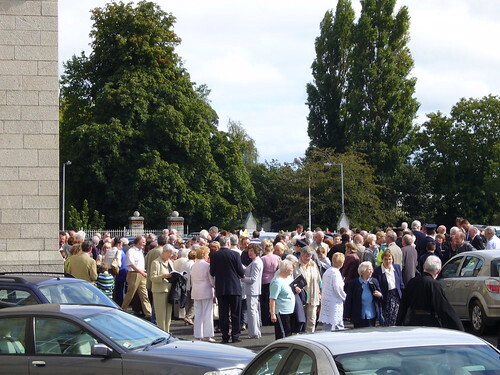 To the left of Father Ambrose is our Provincial, Father Martin, accompanying the President to her car. Unfortunately, she could not stay for lunch as she had another engagement – the All-Ireland Hurling Final at Croke Park. 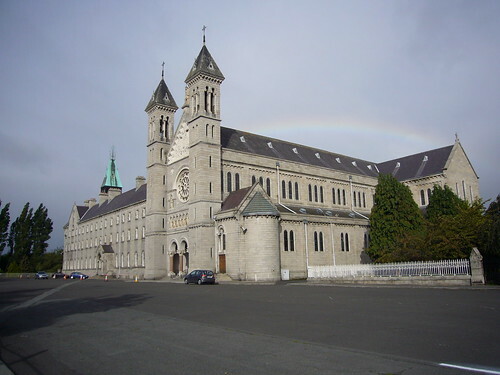 The President’s Chaplain during the Mass was Father Anselm C.P., who is a member of the Mount Argus community and who had baptised her as a baby (i.e. when the President was a baby, not Father Anselm) when he was stationed at Holy Cross, Ardoyne. Afterwards Father Nicholas talks to Pat O’Brien from Belfast while Father Ignatius, Bernard and Thomas talk to the sisters and brother of the late Father Hugh. Father Hugh was bursar of Mount Argus when he died last year; I am sure he is much happier watching all this from heaven, as he didn’t like too much fuss. 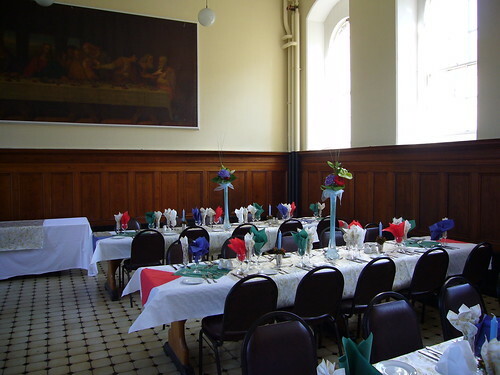 When all the liturgical celebrations were over, we continued our celebration in the refectory. I thought the flowers were just right: they decorated the tables without creating a barrier to conversation. 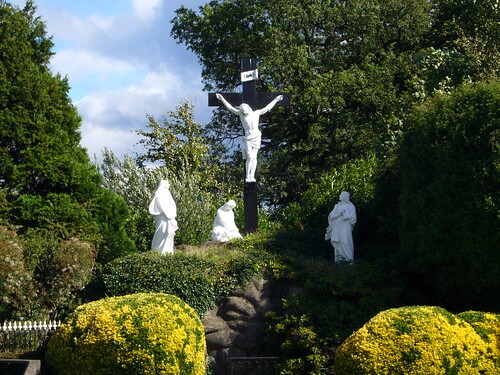 After the meal I went for a walk in the grounds with some of the other Passionists and took this picture of the Calvary, a good reminder of what we were celebrating – one hundred and fifty years of keeping alive in the hearts of the faithful the Memory of the Passion of Jesus.